Just Cause 3 is a whopping 85% off on Steam right now, meaning that if you’ve not picked up Avalanche’s epic sandbox game yet, you’ve really got no excuse, as now you can grab it for less than $5. You’ll need to move relatively fast to grab it though, as the sale ends at 18:00 BST tomorrow, June 2. It’s an absolute steal for one of the most free-form open world games ever made. 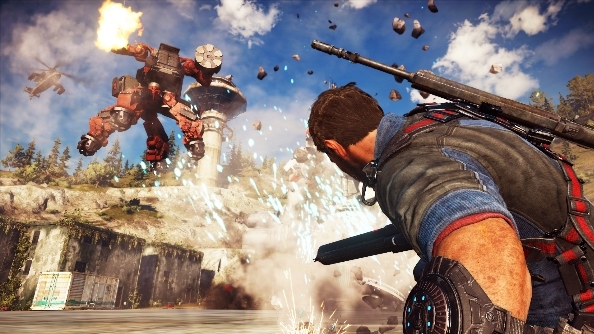 Just Cause 3 maintained much of what made the other games in the series so popular, but adds a wingsuit to hero Rico Rodriguez’s arsenal. That means you can glide effortlessly across the sun-soaked nation of Medici, or, if you’re anything like me, repeatedly crash clumsily into the ground. Just Cause 3 is so much fun to mess around it that it makes it onto our list of PC’s best sandbox games. You can also pick up Just Cause 3 XL edition, which comes with three DLC packs and some cosmetic upgrades, for just $6.74. There are also a handful of DLC-exclusive weapons and vehicles available at 70% discounts, meaning you can pick up a bunch of hilarious extras for what’s essentially pocket change. If you fancy picking up more wanton destruction, you can also grab the Just Cause Collection, which includes Just Cause, Just Cause 2 and its assorted DLC add-ons, Just Cause 3, its expansion pack, and two bonus weapons, all for a total of 83% off. Speaking of Just Cause 2, you can grab that for just $2.49, which is an absolute steal for what I would argue is the best game in the series. I happened to boot it up on a whim the other day, and it still holds up, both visually and gameplay-wise, despite being more than eight years old. It’s pretty much the perfect time to get into the series, which has consistently been hilariously good fun if nothing else. After all, there’s more than enough in those three open worlds to tide you over while we wait for Just Cause 4, which we’re more than a little bit sure will be revealed at this year’s E3 in just over a week’s time.